The third PC-24 prototype, which also represents the series standard, will be unveiled to the general public at this year’s European Business Aviation Exhibition (EBACE) in Geneva, from 22 to 24 May 2017. At the Pilatus headquarters, PC-24 series production is underway and accelerating to ensure on-time delivery of the first customer aircraft after certification. A premiere at EBACE 2017: the third PC-24, the P03, will be presented to the general public for the first time. With its eye-catching, elegantly shimmering pearlescent livery and executive “Zermatt” interior, the Super Versatile Jet cannot fail to wow the public. On display next to the PC-24 P03 there will also be a 1:1 mock-up with a “Vail” style interior, shown for the first time in the flexible 6 plus 2 seating configuration. 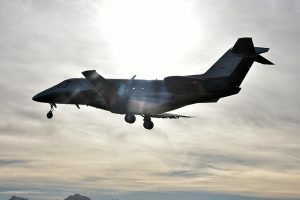 Visit www.pilatus-aircraft.com for more information. This entry was posted on Thursday, May 18th, 2017 at 3:52 pm. Both comments and pings are currently closed. Skytechinc.com Has a New Look! 2014 Embraer Phenom 100E – N250YB for Sale! 2001 Cessna Citation CJ1 N869CB For Sale! Fall 2018 Skytech Advantage Magazine Now Available!